a lot of people, especially americans, have some inexplicable aversion to veggies. sometimes it seems to me that the greener a food is, the more put off some people get. my beautiful better half, who i’ve mentioned on occasion in my posts, likes to tell the story of visiting her grandparents in toledo, ohio while she was still a vegetarian. when they went out to eat, she ordered a salad in an effort to maintain her culinary standards. what arrived was a bed of iceberg lettuce topped with fried croutons and cubed ham, drowned with ranch dressing. a wedge of tomato was added as an afterthought in homage to the word “salad,” but it was purposefully shunned to the side of the plate. but roughage isn’t the only victim. broccoli, artichokes, asparagus, and even green bell peppers are persecuted. if i had a dollar for every time i heard someone proclaim how great broccoli is “if you smother it with cheese and bake it for a long time,” i would be donald trump (but with a luscious mane of hair). i’m not ripping on melted cheese. i’m ripping hiding food under melted cheese. why can’t we all just love broccoli for broccoli’s sake? if you choose to use broccoli, or any ingredient for that matter, the goal should be to incorporate that flavor into your dish, not mask it with spices and greasy cheesy goodness. reduce the elements of the ingredient you don’t like, and enhance the aspects you do. that is, in a very fundamental sense, one of the goals of cooking. enter pasta con broccoli. you could say my beautiful better half loves pasta con broccoli, but it wouldn’t quite apply. i’m not sure the english language has a term for the level of adoration she has for it. maybe “venerate”? “adore”? “be enamored of”? in any case, she really likes it. “yeah, but poor man, you literally just finished talking about how you shouldn’t mask broccoli under a blanket of cheese. how’s pasta con broccoli any different, you dirty hypocrite?” well, i’ll tell you. pasta con broccoli, when pulled of skillfully, adds special something to broccoli that is doesn’t quite have on its own. the density of broccoli’s curd and the texture of its stalk make it a nearly ideal vegetable for inclusion in a cream sauce-based pasta. cream sauce is improved by the presence of broccoli, as well. the smooth creamy texture of alfredo can get a heavy at times, and the crispness of broccoli can turn a traditionally sickeningly rich meal into a much lighter affair. sure, veggies ain’t bacon. but they deserve your love and respect because, believe it or not, their nutrients and culinary properties can add some pretty amazing things to a dish which even bacon can’t hold a candle to. get the knife out and cut those veggies. wash the shiitake mushrooms with cold water, then remove their stems and slice them extra thin. peel the garlic and mince it finely. last, cut the broccoli into florets. remember, there is nothing wrong with leaving a good amount of stalk on the curd. it adds to the texture of the dish and keeps the nutrient content intact. put the penne in a pot and add enough chicken stock to cover it. bring the contents of the pot to a boil, then cover and reduce the heat. after about four minutes (or when the pasta is about half cooked), kill the heat and drain the stock. if you want a thicker sauce, make sure to retain a few tablespoons. you’ll use it later. return the pasta to the pot, then add butter, heavy whipping cream, broccoli, oregano, parsley, garlic, and salt and pepper to taste. bring the mixture to a boil over medium heat, making sure to stir it on occasion to keep that cream from burning. while the pasta is cooking, add a little bit of butter or olive oil to a frying pan and saute the shiitake for a minute or two. set them aside. if you chose to retain some chicken broth, mix it with a tablespoon or so of flour, stir until there are no lumps, and reintroduce it to the pasta. this will sometimes give the sauce that little extra thickness that it needs. when the pasta is a few minutes from being done, toss in the those mushrooms you sauteed. last, kill the heat and stir in the cheese a little bit at a time. serve with some toasted italian bread to make sure none of that magical, magical sauce goes to waste. note: i am aware that my pasta con broccoli recipe differs from most. first, i conciously choose not to include tomato sauce in mine because i want the flavor of the broccoli and mushrooms to take center stage. second, i do everything within my power to maintain at least some of the crispness of the broccoli. it goes into the pasta raw, not frozen or pre-steamed. if the broccoli starts to disintigrate into the sauce, it is most likely already too late. soggy broccoli is a tell-tell sign that most of its nutrient content and delicious texture have gone the way of the dodo. 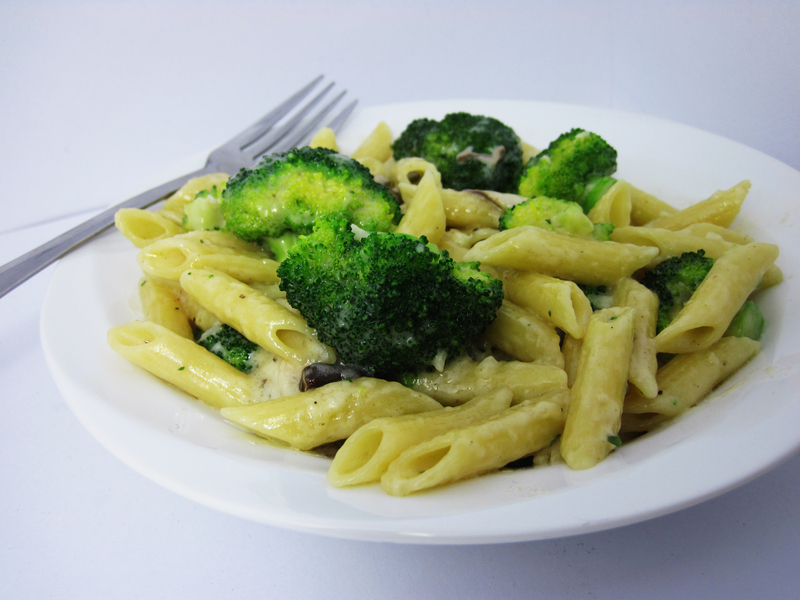 This entry was posted in culture, dinner, recipes, tips/advice and tagged Broccoli, Cheese, Cream Sauce, Heavy Whipping Cream, Pasta, Vegetables. Bookmark the permalink.